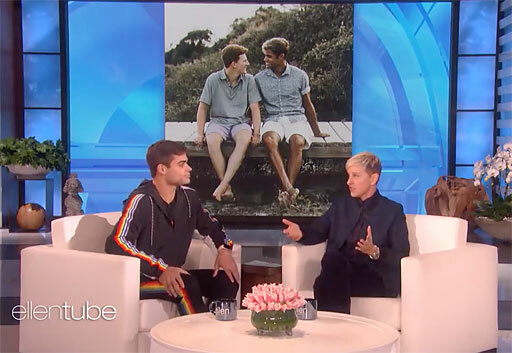 Ellen DeGeneres sat down with out Indiana State University football player Jake Bain, who inspired the nation with his coming out speech during a high school assembly in St. Louis, Missouri, two years ago. 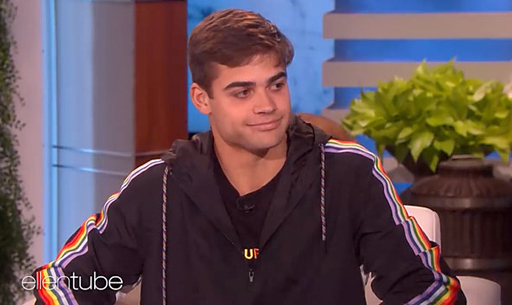 Jake chats with Ellen about his coming out experience, the support he’s received over the past two years, and his hopes to inspire other athletes in college sports to have the courage to also come out. Ellen points up the good that Jake has done by coming out and hopefully giving other college athletes the courage to come out. “It’s a really conflicting thing to feel really proud of yourself and good at something, and then in the back of your mind have shame or carry shame around,” said Ellen. On top of doing great at Indiana State (full football scholarship, don’t you know? ), the good news is he’s still with his high school boyfriend, Hunter Sigmund. The boys see each other whenever they can since Hunter goes to school hours away at the University of North Carolina. So, Hunter tagged along for the Ellen appearance. And you knew this was coming - since Jake can’t accept gifts due to NCAA rules, Ellen gives Hunter a 6-night vacay to Fiji. Gee, I wonder who Hunter could take with him…?